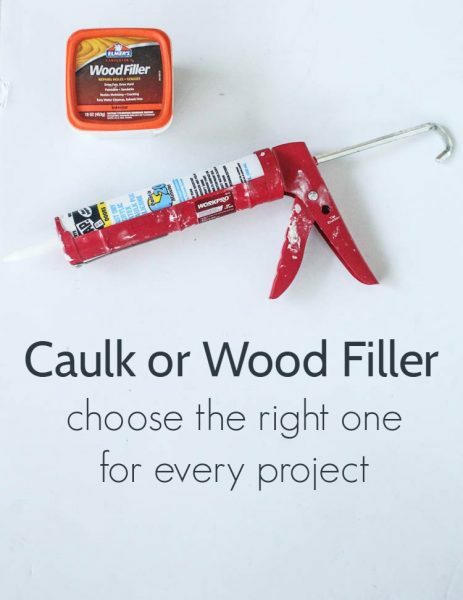 Caulk or wood filler: choose the right one for every project - Lovely Etc. Ok, so caulk and wood filler may not seem like the most exciting thing to talk about, but if you want to make even the most basic upgrades to your home, you’re going to need to know about caulk and wood filler. What they are, what they do, and most importantly, what is the difference between the two. 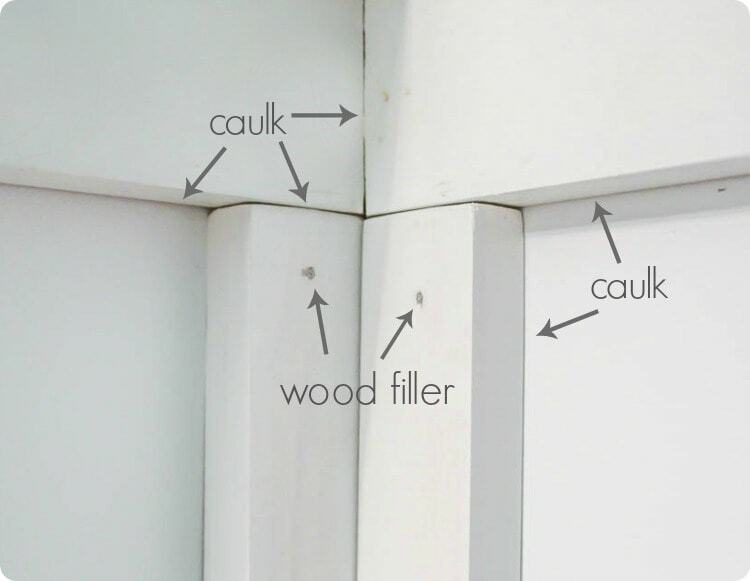 The first thing to know about both caulk and wood filler: they are magical things. Maybe a slight exaggeration, but seriously, they can turn something ugly and amateur-looking into something smooth and gorgeous. 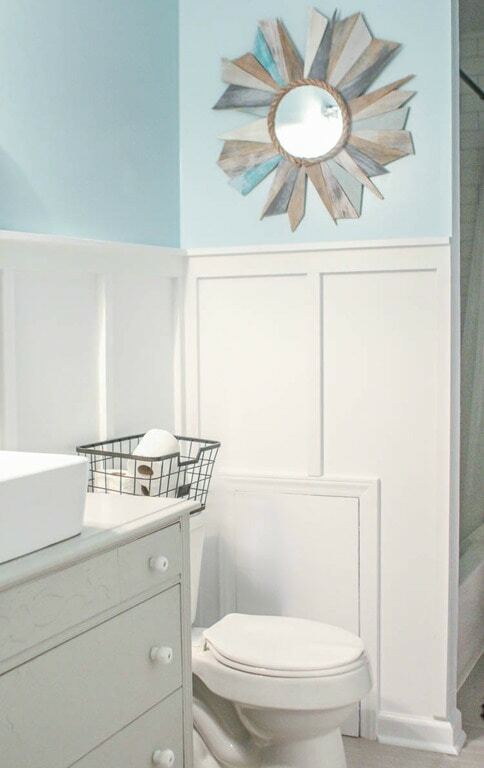 Earlier this year, when I installed DIY board and batten in our bathroom, both caulk and wood filler helped make the whole project look amazingly professional. Got trim that looks like a kindergartener installed it? Chances are caulk can save it. Got a hand-me-down dresser with huge gouges in it? Wood filler can fix that. If you have any intentions of ever building, fixing, or simply maintaining anything in your home, caulk and wood filler are going to be your best friends. The problem is it isn’t always so simple to know which one to use. They both fill gaps and holes, so it kind of seems like either one will get the job done. But use the wrong one and your project may end up looking even worse than before, so here are some super simple guidelines to follow. Wood filler (also called wood putty) is exactly what it sounds like – it fills holes in wood. It dries very hard, can be sanded smooth, and can be painted to blend in. Some wood filler can also be stained to match the surrounding wood, though it can be pretty tricky to match the color. Wood filler typically comes in beige color (Similar to the color of unstained wood), but you can also buy white wood filler. Some wood filler needs to be mixed with water, but most wood filler comes already mixed and ready to use. You can apply it with your finger or with a small putty knife if you prefer. Personally, I really love wood filler because it is so easy to get a pristine finish. You don’t have to be very meticulous when you apply wood filler, because you are going to be sanding it smooth anyway. Fast and easy just the way I like it. Caulk is used to seal any gaps wherever two surfaces meet. There are lots of types of caulk and they can be used for all kinds of purposes: creating an airtight seal around windows and doors, creating a water-proof seal around bathtubs and sinks, and filling in simple gaps around baseboards and other molding. Caulk can be silicone or acrylic. Silicone caulk is waterproof and lasts longer without shrinking or cracking. But it can’t be painted. 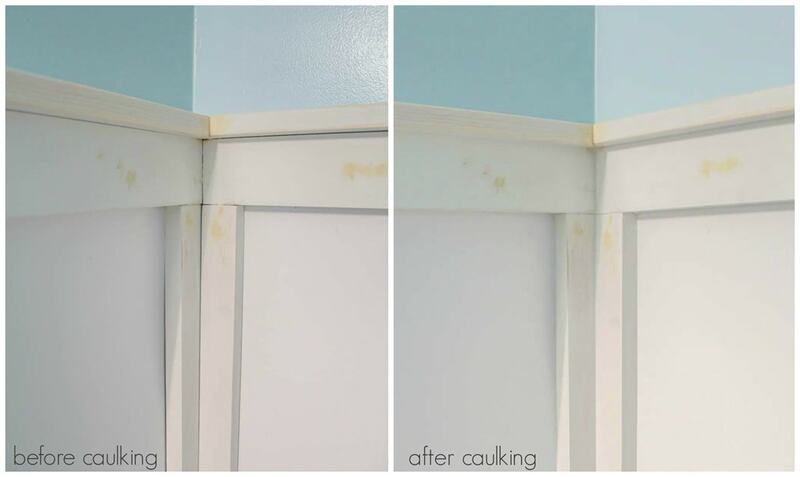 Acrylic caulk is easy to use, easy to clean up and can be painted to match the surrounding trim and walls. But it can become distorted over time so it isn’t a good choice for all applications. Really, you don’t have to worry too much about all that though because the different types of caulking are clearly labeled. The caulking choices at your local home improvement store will clearly say on the label if they are to be used for windows and doors, bathtubs, etc. and also whether or not they are paintable. Just remember caulking needs to be applied very neatly because it can’t be sanded. On the other hand, caulk is terrible for filling nail holes and other holes in wood because over time it will shrink and cause a divot. 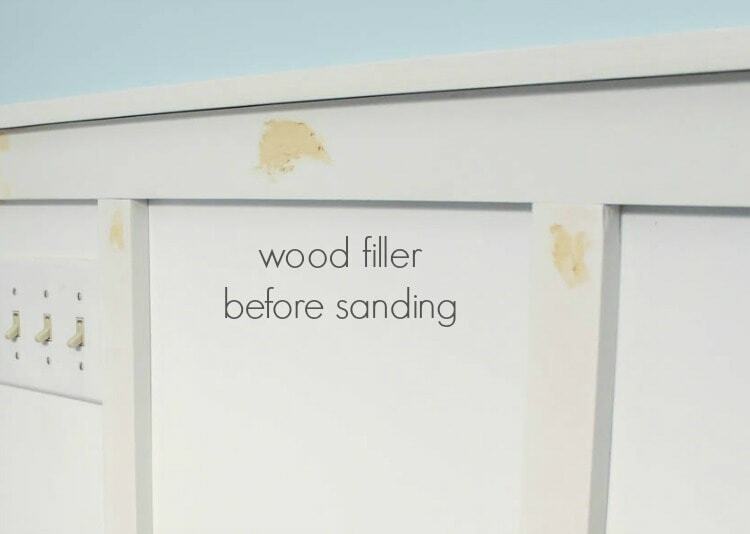 And wood filler is a terrible choice for filling gaps in trim – it would take forever to apply and sand. But either one in the right situation can be magical! Check out the final results of my DIY board and batten. This was my first time doing anything like this, but after all was said and done, it looks amazing! Thanks for sharing your insights. About to tackle my baseboards with nailholes and adjoining edges. Thanks. Exactly what I needed. Just about to tackle window sill cracks! Caulk all the way! This is the exact information I was looking for. Thank you!